I specialize in William Morris tile and Morris & Co. designs, and then a slightly wider circle around that in both time and space: William DeMorgan, the Rossetti Pre-Raphaelites, English and Morris-inspired next-generation Arts & Crafts, Glasgow School, Victorian themes, and William Morris interests: Chaucer and Camelot, Scandinavian, Medieval, and Forest themes. 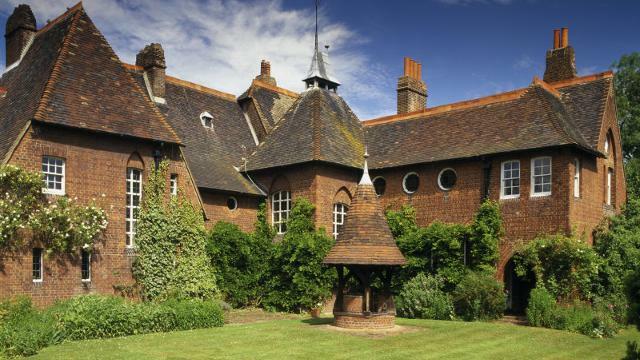 If you aren't familiar with William Morris and the Arts & Crafts movement, you might like to read my article, William Morris, The Soul of Arts and Crafts. "But why William Morris?" you ask. Short answer: Because things are more than things; they carry meaning and meaning allows us to form our values. Arts & Crafts items are made by people for people, not by machines for money. Morris was reactionary to what he considered poor quality, cheap, and especially soulless mass-produced decorative art. Tile was one of the first media taken up by Morris. 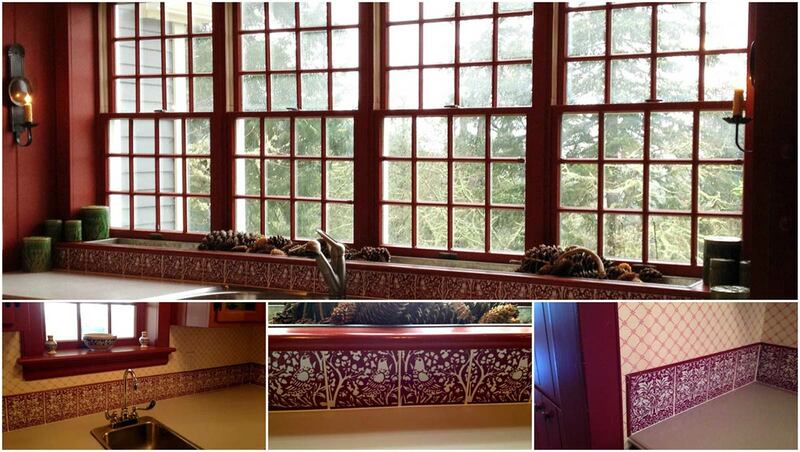 Tile designs are "portable" and he could make something tangible and beautiful without years of apprenticeship. Designs such as the early fairy tale tiles done by Edward Burne-Jones for Morris were revisited in paintings, and tapestries, with designs adapting to the media. The good news is it's hard to make a mistake here. As the father of the Arts & Crafts movement, Morris designs work in later Arts & Crafts homes. De Morgan and Mackintosh transition from Arts & Crafts to Art Nouveau. Medieval tiles work because Morris and Ruskin, like other Victorians, were fascinated with medieval culture, Chaucer, tales of Camelot and the Holy Grail. Tumbled marble tiles, originally handcut from slab and only owned by kings and emperors, can work in traditional homes, classic Victorian homes, or Arts & Crafts homes. 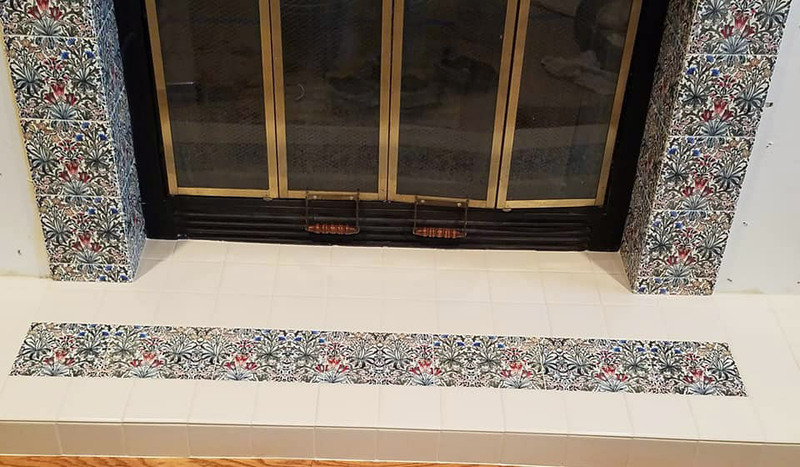 The customer photos Kitchen Tile Installations show some beautiful marriages of stone, glass, and ceramic subway field tile with period accent tiles. Decorative Tile. Tiles here are decorative tile with a William Morris twist: the intention of elevating the decorative arts to the level of fine art. Decorative tile means, at its essence, that you can't walk, ice skate, or use it for industrial utility. Tiles for those purposes have a different rating, and these aren't that. 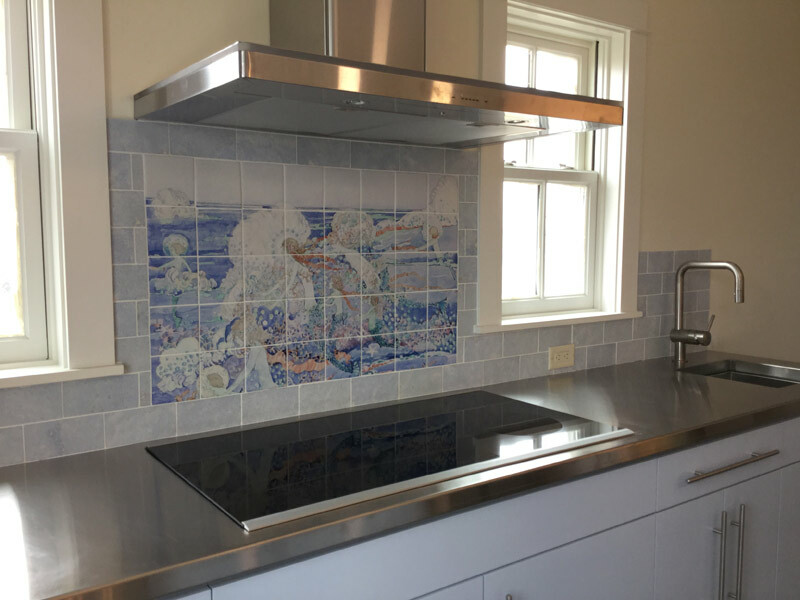 You can install them in kitchens as a border or backsplash, bathroom showers and baths, as fireplace overmantels or side panels. You can use it on your hearth if you wear socks, but not your golf cleats. I have one type of blank that is suitable for a garden, if you live in a temperate climate and install it in a protected area like Morris's Pilgrim's Rest porch. If you live where the weather can be extreme, then relief tiles made for exterior application are safer. From there, tiles here are either Victorian / Arts & Crafts Reproduction tile (Morris, De Morgan, Morris & Co. tiles) or Art tile (Glasgow School, Pre-Raphaelite, Medieval). Most decoratiave tile here is Victorian, even the Arts & Crafts tile, although some tiles, such as the bluer and white De Morgan ships or William Morris daisies are more what people think of when they think of Victorian tiles. Decorative Reproduction Tile means that the original design was for a tile, or in a wider circle, a decorative art such as textile pattern, or stained glass design, and adapted for tile. This is very Morris & Co.; Morris and his friends often adapted designs for one method to others. Art Tile. Needs no elevating to the level of fine art because it started as fine art. An art tile came from something else: a drawing or painting. Ocassionally, decorative and art tile overlap; the bestiary dragons I mentioned actually come from both. Jessie M. King Mermaid Tile Backsplash. Choose your project. If you can, start with the place you live most. Arts & Crafts homes are traditionally open, with lots of dark wood, windows, where strong and autumn colors are at home. Victorian homes are more hierarchical in design and lifestyle, drawing rooms with closed doors, a closed off kitchen apart from living areas, good place for bright colors and pastels. Victorian kitchens focus on a central table where women or servants worked together to create the meals. Twenty-first century kitchens often open to a family area, there may be an island but most work takes place facing inward, at counter or sink. There's a dynamic being created here: You create the place, the place influences your focus and emotional state. Find tiles that make you happy. The Morris philosophy is that your home is your work of art. These are guidelines, but really great art breaks rules. Tudor or Victorian Home: Morris designs are Victorian but relatively uncluttered by Victorian standards, with natural lines and motifs replacing geometric designs with natural elements inspired by medieval culture and values. Arts and Crafts designs were never mass produced. If it reminds you of something medieval, it's Morris Arts & Crafts and will work in a Victorian or Tudor home. Kelmscott Manor, Morris's favorite home, was a Tudor richly decorated with his own designs. American Arts & Crafts, California Arts & Crafts: Even cleaner lines, but with a heavy emphasis on wood and stone. California Arts & Crafts may show a Mediterranean influence with heavy use of oak and richer stains. If that's the case, you may want to go with stronger colors. Both Morris and De Morgan tiles will work in an Arts & Crafts Home. Craftsman: You probably recognize this as furniture with slats. Gustave Stickley's brand of Arts & Crafts, often mass-produced and with a minimum of ornamentation which showcases the natural beauty of the materials. Later De Morgan tiles, as well as Glasgow and California tile collections are good candidates for Craftsman homes. Art Nouveau: Arts & Crafts after its European vacation. Natural motifs, pleasing curves that can angle in unanticipated ways. Has been described as Arts & Crafts with whiplash. Glasglow tiles and are safe choices, but safety and predictability are not Art Nouveau / Jugenstil characteristics. Later De Morgan tiles have a stylized natural form that is consistent with Art Nouveau. Look in the catalog for an overview of pages by style and customer installation photos. These link to individual tiles pages with more details and options. Alternatively, the site map, mostly text, lists almost every page by category. It is divided into general areas (articles, site-specific stuff, tools, and of course tile). From there, the areas become increasingly granular. Customer installation photos can give you an idea of what's possible. You can also Search for a pages containing a key word or phrase such as type (e.g., nursery tiles), designer (e.g, William De Morgan), or format (e.g., mural). The search tool will return your keyword if it is in the Page title or Major heading. I always maintain the sitemap and the catalog. It is helpful to have a rough idea of your measurements. You just want a rough idea. 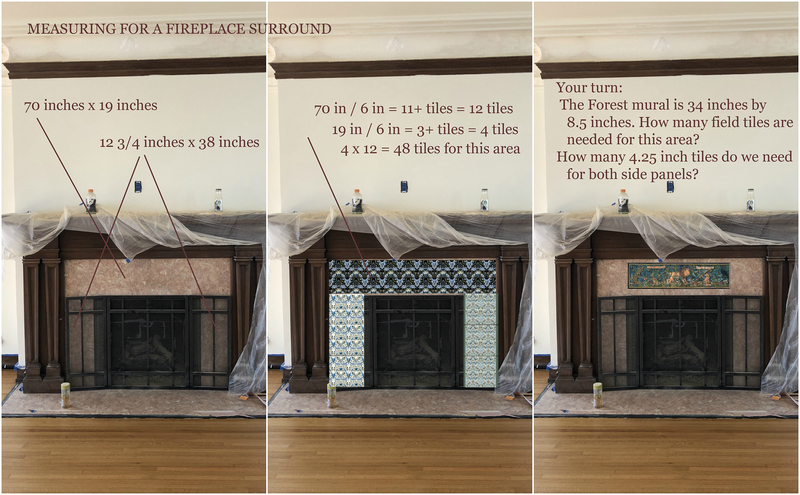 Tile and panel sizes can in many cases be modified, but if you have a large space to fill, falling in love with a 12 inch fireplace panel may take you in a direction that is better for another project. If there are obvious sections, such as the sides and top of the fireplace surround, measure each section separately. When measuring, it will only occasionally work to figure the tile you need based on the area of the space. For example, the tileable space around your fireplace may be 12 feet, but if the space between the mantel legs (pillars) and the hearth is only 6 inches, flanking eight-inch tiles won't work without without removing the mantel legs, something that dividing total area by the individual tile size can't tell you. What if Everything Doesn't Fit exactly? It is the usual case that the tiles you want will not fit the space exactly. Don't let this alarm you. For some patterns, a top or bottom tile can be trimmed. For others, we may well be able modify the pattern you want to fit the space. In this photo, the turquoise peacocks are on 8 x 6 inch tiles, although the panel size is only 7 inches wide. 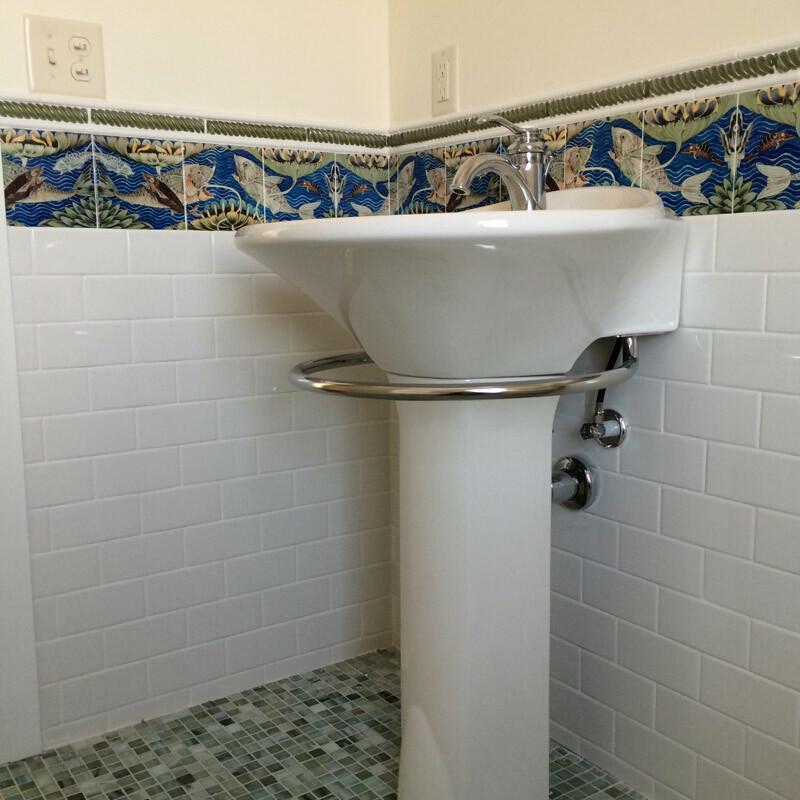 The pattern was adjusted slightly to leave an inch of white space on either side, and the peacock tiles trimmed at installation time. All of this is solvable. Small areas can also be filled with mosaic tiles to form a border. Some people will tell you to divide the area by the size of the tile, but this is a bad idea for patterned tile as it relies on cutting tiles by the installer, which may or may not go as well as one hopes, and results in more wasted tile. It's also helpful to know the dimensions before you choose to align your pattern and avoid mishaps such as having an angel's face cut in half. You can measure for tile yourself! Divide your project into rectangular shaped areas. Don't worry if you have an arch, arches require cutting so you can take the longest point as your length. Measure the width and length of each area. Write these down. Repeat the above steps for each rectangular area. The left side between the pillar to to the firebox itself up to the top edge of the firebox. (width and length). The right side between the pillar.... (width and length). The space between the the top of the firebox (but above any hood) and the bottom of the mantel (width and length). Continue with any other surfaces you want to tile (hearth, any angled areas). Once you have your measurements, you can estimate your number of tiles. If you're not sure the size tiles you need, just send me the measurements for each direction and we'll figure out how to make it work with the tile design you like. For each area you just defined, divide the width in inches by the size of the tile. This tells you how many tiles in one direction. Round up to the next highest number. Multiply the number of tiles in the length by the number of tiles in the width. Write this number down. Add the number of tiles from all areas. It's traditional to order 10-15% more tile than you exactly need, but I find this can be too much. You probably won't need more than 2-3 extra tiles at most, unless there will be a lot of cutting in your installation. In that case, maybe 5. The left pane, width by length, are the only steps that really must be done before ordering a surround. Especially if you have a mural or need different size tiles, you may find it easier to just send me the measurements. You can, if you like, order tile as shown. If you want to change things slightly, or want bespoke tiles, well probably half the people who visit here also want that. Finding the right set for each person is the best part of making tile. If it's a slight modification, there are no additional charges; go directly to How to Order Tile. If you want something I don't have here or require help with a design, Custom and Bespoke Tiles are for you. Copyright information: Images of tile products on this website are ©William Morris Tile, LLC. They are derivative works requiring considerable creative effort. You are welcome to use the images, with attribution, for any non-commercial purpose, including displaying them on your blog or personal website. You may not use them for any commercial purpose without written permission, including but not limited to creating counted cross-stitch patterns, calendars, or any other commercial purpose.